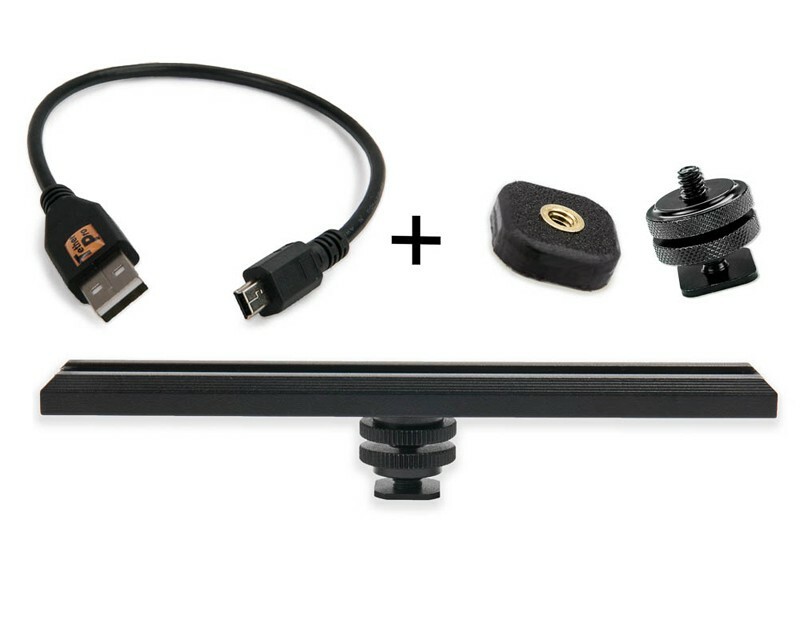 The CamRanger Camera Mounting Kit for USB 2.0 provides a secure way to mount the CamRanger on a DSLR in a convenient and secure manner while shooting. The kit includes the Rock Solid Accessory Extension Bar which allows multiple devices to be mounted on a DSLR in a safe and rigid configuration. A rigid CamRanger mount minimizes accidental USB cable disconnects and may prevent costly interface port damage to the CamRanger or DSLR. The 1ft (30cm) TetherPro cable is the ideal length to minimize dangling cords and keep all accessories clean and out of the way. Also included in the kit is a Rock Solid Mighty Mount + Shoe Adapter which turns any device into a ¼”-20 mountable piece of gear. *Please note the Accessory Extension Bar is a cold shoe mount. It you are using radio triggers a sync cable may be required. Consult your radio trigger manual for details. *If you are planning to adhere the Mighty Mount on a CamRanger take caution not to cover the serial number on the bottom of the unit.